The day before my husband and I went to Yellowstone this summer, we stopped at a used bookshop in Missoula. Missoula, Montana, is one of those places that is never far from my radar, as a lot of people I meet in southwest Colorado have lived in Missoula. Mountain people tend to have locations in common, and Missoula and Durango are similar beasts. In the same regard, Aspen, Telluride, Sun Valley, and Jackson Hole occupy a strata of mountain town separate from the Missoulas and Durangos of the world. The separation is created by class, and whenever I look at the world through that lens, I feel like a child with a stick poking at things that don’t want to be poked. Which leads me to the topic of my blog today: Edith Wharton. But back to Missoula first. And the bookshop. I’d never been to Missoula, and though Greg and I didn’t spend much time downtown, bookshops are always a must. There was a first edition of The God of Small Things on sale in this store for $7.00. I would have purchased this book, but the interior of the hardcover binding was torn. I gazed over the literary fiction shelves for about 15 minutes, and there was a guy shopping the same shelves who was rather annoying. He bumped into me twice walking by, even though there was plenty of room to navigate between the shelves without coming into physical contact. I didn’t get the sense this guy was flirting at all, just that he was being a jerk. He seemed a good ten years younger than me, and ramming my shoulder was definitely his fault, but he never said he was sorry, or acknowledged what he had done in any way. Did he perhaps have a mental disorder of some kind? I didn’t ask, probably because I didn’t care for the look of his face, which I labeled as smug. Also, the smell of old books is different from the smell of new books, and sometimes that odor overpowers me in unpleasant ways. This shop was full of old, musty books, especially of the nonfiction variety (and we all know that nonfiction books just don’t age well at all– while most fiction is timeless, most nonfiction has a shelf life, and then curdles quickly)– anyway, that strong musty smell, and this uncouth male shopper, kept my browsing time limited to ten minutes. But what a productive ten minutes it was! I found a copy of Ethan Frome for only $2.00– and this copy had an introduction written by Dr. Donald R. Makosky, Professor of English, St. Lawrence University. Since St. Lawrence University is my alma mater, I knew this book was mine. 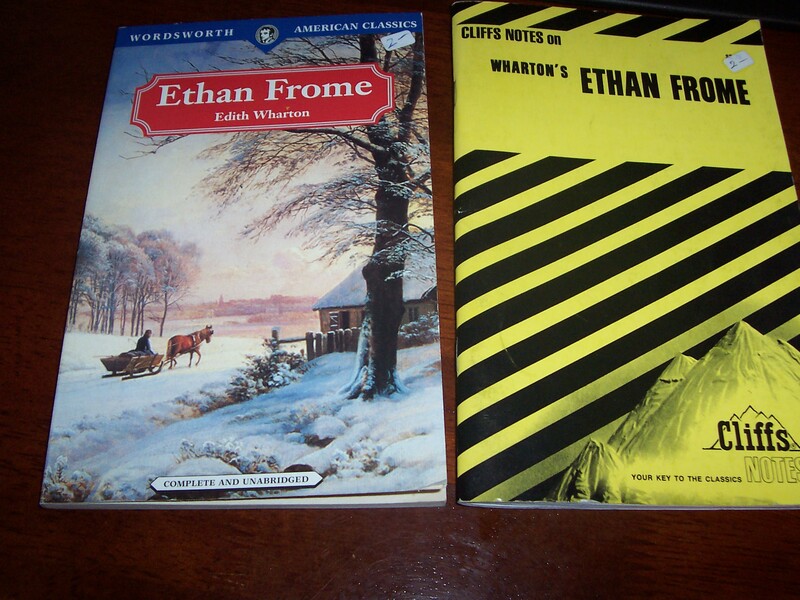 I also found a copy of the Cliffs Notes on Ethan Frome, which was also only $2.00. I’ve only read one other Cliffs Notes, and that was for The Sound and the Fury, one of the most agonizing reads I’ve ever undertaken. Since I knew nothing about Edith Wharton, and had no way to google her in the car, I bought the Cliffs Notes so I could read about her. I was also a little scared I wouldn’t understand Ethan Frome, since I’d never read Edith Wharton before, and this book was published in 1911. A few minutes later, back in the car on our way to Yellowstone, I read about Edith Wharton’s life, and then started reading Ethan Frome. I read aloud, so Greg could hear. And also because, when reading difficult text, speaking the words helps my brain’s comprehension. Which, looking back, seems ridiculous. That I worried so much. Because Ethan Frome is nothing like reading Faulkner. Ethan Frome is easy to read, and so completely enjoyable that Greg was totally hooked. Greg does not enjoy fiction, doesn’t care for novels at all, but he couldn’t get enough of Ethan Frome, and he hung on every word. Even once we arrived home, and were no longer trapped in the car (providing an excuse for this reading exercise), I brought the book into bed and finished reading it to him there. My husband really enjoyed this novel, and so did I.
I know I shouldn’t worship at the altar of youth and beauty, but sometimes it’s just impossible not to. Sometimes I just have to stare at a picture and be allowed to say, “Ohhhhhh…” with the sort of wonderment I displayed for My Little Ponies circa 1986. Because the little kid in all of us never stops responding to being dazzled, and Edith Wharton is simply dazzling. As a person, in her life, in her work, in her passion, this woman was a powerhouse, and this photograph is an image of someone who was beautiful inside and out. The Cliffs Notes provided far more information about Edith Wharton’s marriage and love life than most websites do, so my $2.00 purchase was far better than a smart phone would have been. The websites mention more of her amazing charity work during and after World War I, which is great, but knowing how much Edith Wharton struggled to find herself, embrace her gifts, and experience love, makes the fact of her charity work all the more meaningful and beautiful to read about. History has a terrible way of distorting people, of making them dry and colorless, rather than the complicated, passionate, sexual creatures we are during our time on earth. Edith Wharton was a total badass while she was alive, and I’m grateful I finally started reading her work. Also, I should say it’s inspiring that she didn’t write her first book until she was 36, and didn’t publish her first book until she was 40, when she is obviously completely brilliant, and could have been publishing books long before then. Cliffs Notes focused on the beauty of her language, the genius of her word choice, but Edith Wharton is far more than a wordsmith of beautiful sentences. She is a master of plot, and that is what made Ethan Frome so addictive, and kept my husband and I enthralled– that short little book invites the reader to tear through it, desperate to find out what has happened to Ethan and the woman he loves– and the ending is startling and powerful, the product of a master storyteller. Like an MLB pitcher with a wicked good curveball. I didn’t see that ending coming at all. What I always knew of Edith Wharton, before reading her work, was that she was a girl with a stick, poking at issues of class that didn’t want to be poked. She didn’t write magical realism, she wrote social realism, especially tales of the wealthy members of the Gilded Age watching their vanishing lifestyle. Like Proust, she is a writer who evokes nostalgia, an awareness of time passing, distorting our memories, distorting what we understand of ourselves. After reading Ethan Frome, my earlier knowledge of Edith Wharton and her work is still true, but now I know she isn’t anything like reading Faulkner. She has an accessible voice in her work, and writes with plot, really good plot. She was a deeply fascinating person who loved to travel, loved to help the less fortunate, loved France, loved gardening and designing things, and was just overall awesome. So here was another discovery I made while on vacation: Edith Wharton is a complete badass. I’m really looking forward to reading The House of Mirth (1905) and The Age of Innocence. I’d also like to read a biography of her as well. I have officially entered the I’ve-read-Edith-Wharton club. It’s a great club to be a member of. Highly recommended.